"Men were killed while squatting just as low and as close to the breastworks as it was possible for them to get. Tom Atkinson, poor fellow, was shot through the head, right by my side, another man in Company "E" was killed on the other; the man in front was shot through the body. I did not realize then what a hot place we were in. It was a wonder to me that the last one of us was not killed." 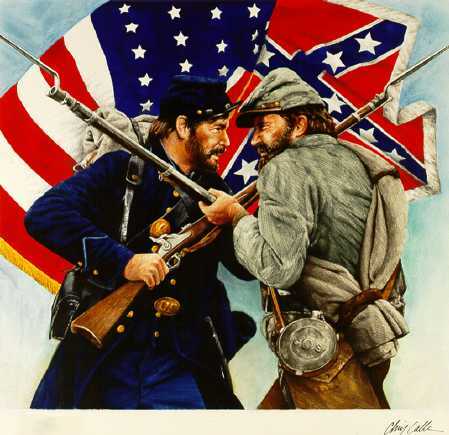 �Walter Battle, 4th North Carolina Infantry, wrote after the battle at Spotsylvania Courthouse. Civil War soldiers usually entered combat for the first time with little true understanding of what was about to happen to them. The confusion of the battlefield (smoke, gunshots, cannon fire, screams) �played� upon the nerves of each soldier. Some helped wounded comrades back to aid stations to avoid the fury, while others simply walked or ran away. What kept most in line is not always an easy thing to determine, however, most likely things like: camaraderie, honor, courage, and probably at times the knowledge of their cause. Often the most difficult part of combat was the anticipation and waiting around for it to happen. This unnerved the men greatly. During combat when adrenaline kicked in the average soldier usually experienced some �fight or flight� sensations, but for the most part with the fighting came relief and focus. Soldiers marched into battle and had to maneuver in the fog of war with precision and under instruction from commanders. They had to maintain discipline and follow orders as well as they possibly could. It was crucial that soldiers be able to maneuver as instructed, stop and fire, reload quickly, and then be able to pick up and maneuver again. All this as bullets hissed and cannon balls screamed passed them. Step 3 > Take a moment develop 5 questions that you have about combat experiences for Civil War soldiers. For example, "What was combat like for Civil War Soldiers." 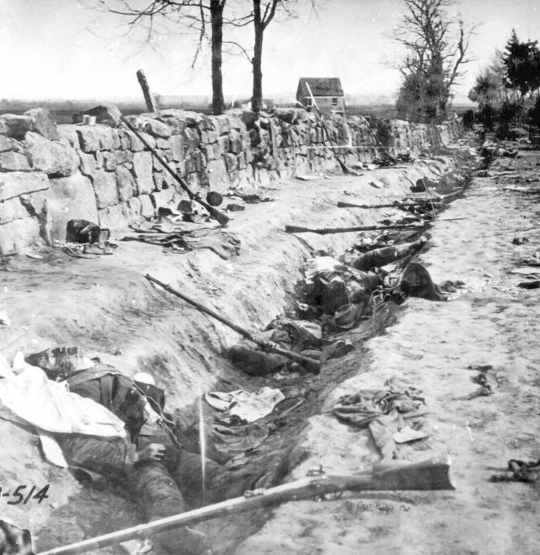 "Men were killed while squatting just as low and as close to the breastworks as it was possible for them to get. Tom Atkinson, poor fellow, was shot through the head, right by my side, another man in Company "E" was killed on the other." Q1) Walter Battle was exposed to fire for many hours and saw friends die in front of him. Why do you think he was so surprised by the horror of the battle and that he survived? "No day of my life has been so full of stirring terrible events as this. Never may I see such another. Even now my mind is agitated & as I think of what I have seen this day visions dark & bloody float before my eyes & sounds of death & suffering fill my eyes." Q2) Read the first 5 or 6 paragraphs and describe one of Mecklin's experiences that most shocked you and how you think it might have affected him? Robert Cruikshank enlisted August 5, 1862 and was appointed First Sergeant of Co. H 123rd Regiment New York State Volunteers. He took part in fighting at Gettysburg, noting the highlight of an attack: "We advanced into the woods and in the rear of the 20th Connecticut where we could see our works, when the order came to charge. The men began to cheer and run forward, firing as they advanced, bayonets fixed. The battery ceased firing. On we went over the dead and wounded; the enemy falling back, we soon reached our works and held them. The rest of the Brigade advanced and took their old places in the line and the gap from Spangle's Spring closed." Q3) What were Cruikshank's experiences at night and what effect might they have had on him during the rest of the war?